On 21st morning, you will be received by our executive, who will be waiting outside for receiving you and proceeding for Phuentsholing (980 ft./54 km/1 & half hours) ,through the lush green as well as most beautiful Tea garden in Dooars. On arrival at Phuentsholing, The most rapidly growing town in Bhutan, our office executive will guide you to the immigration to make permit & after permit done, evening scroll in a market & Night Stay. After done with the breakfast, we will proceed to Paro, on the way views of waterfalls & Chukha Dam & Evening scroll in a market &Night Stay. proceed towards Thimpu & Night Stay. National Museum: It is housed in the Ta Dzong (watchtower). Here an intriguing collection of artifacts provide a wonderful introduction to the rich culture and heritage of the Kingdom. Drukgyel dzong: Drukgyal Dzong was one of the four principal Dra Dzongs (defense fortress). Accounts differ on the founder of Drukgyal Dzong. It is said to have been caused by the fire when a butter lamp fell in the central tower. Only the ruins of giant walls, charred gigantic wooden posts, beams and watch towers can be seen of what was once an important fortress that repelled several invasions from the north. Taktshang Monastery: (Tiger Nest) is located at top of about 800 meter cliff in Paro. It takes slightly more than an hour and a half to reach the monastery on foot from the nearest road point. Taktshang or the Tigers lair as the monastery is widely regarded is one of the most important in Bhutan. Its history is associated with the visit of Guru Padmasambhava, the Indian saint who came to Bhutan in the 8th century AD. The cave was named Taktshang after Guru Rinpoche flew into the cave from Kurtoe Singye Dzong in eastern Bhutan riding on a tigress. Later in 1692 the fourth Druk Desi Tenzin Rabgye started to construct monastery and finally completed after three years in 1694. Jangsarbu Lhakhang: It is located behind Paro Dzong. This small and insignificant looking temple is home to a magnificent statue of Sakyamuni Buddha that was carried all the way from Lhasa, and also houses the protector deity of Paro. Legend has it that the statue of Sakyamuni was destined for Paro Dzong and merely placed in the temple for overnight safe keeping. However, when the time came to move the statue, it proved impossible to lift. As a result, it became a permanent feature of the lhakhang. National Memorial Chorten: It is continuously circumambulated by the faithful, murmuring mantras and spinning their prayer wheels. Construction of this landmark was the idea of Bhutan’s third king, His Majesty Jigme Dorji Wangchuck (“The Father of Modern Bhutan”) who had wished to erect a monument to world peace and prosperity. Completed in 1974 after his untimely death, it serves both as a memorial to the Late King and as a monument to peace. Buddha Point: One of the biggest Buddha in the world. It was constructed through donations from devotees all around the world. Folk Heritage Museum: It is one of the oldest traditional houses. This house has been around 150 years old. It once belonged to one of the affluent family. 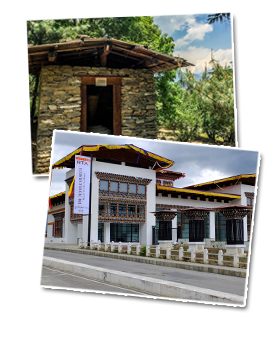 Government has converted the house into museum in 2001 in Thimphu providing visitors and tourists with fascinating insights into the Bhutanese material culture and way of life. The Folk Heritage Museum with a three storied, 19th century traditional house provides you a glimpse of the Bhutanese lifestyle, and artifacts from the rural households. One can come across typical household objects, tools and equipments. National Textile Museum: National Textile Museum which was opened in June 2001 is worth a leisurely visit to get to know the living of national art of weaving. Changing exhibitions introduce the major weaving techniques, styles of local dress and textiles made by women and men. The small shop features work from the renowned weaving centre in Lhuntshe Dzongkhag, in north-eastern Bhutan. Tashichodzong: The beautiful medieval fortress/monastery which houses most of the government’s office and King’s Throne room. It is also the summer residence of Je khenpo,the Chief Abbot. The fortress is opened from 9am till 5pm during weekends and during weekdays it’s open after 5pm till 6pm. National Library : With extensive collection of Buddhist literature mostly block-printed format, the library contains works of several hundred years old literary treasures of Bhutan. It also has a small collection of foreign books. 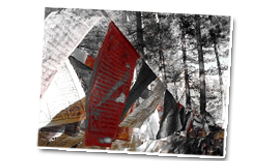 The library has texts relevant to Mahayana Buddhism and a rich collection of lithographs from whence scriptures and prayer flags were printed in the old days. The National Library was established in 1967 to preserve ancient dzongkha and Tibetan texts. This library building was built in 2001.The world’s biggest published book is also in this library. Bhutan, the book weighs 68 kilograms and is over two meters tall. After done with the breakfast, we will do the half day sight seeing and then drive to Phuentsholing & Night Stay . Takin Preserve: The preserve houses the Takin, a unique, endangered species found only in Bhutan, Nepal, China and Burma. Bhutan has chosen it as the national animal due to its significance in the country’s religious and cultural history. National Istitute of Traditional Medicine: Bhutan although modernized with time still emphasizes on traditional medicines. There are some people who still prefer traditional medicines over modern. The traditional medicine is popular among locals and some foreigners.The National Institute of Traditional Medicine is a training centre for medical practitioners. Herbal medicines are prepared and dispensed here. Bhutan has rich tradition of medicine based on natural remedies derived mainly from plants, earth and some animals. The institute collects medicinal plants from remote corners of Bhutan’s Himalayan region such as Lingzhi, Laya and Lunana.The institute has facility for outpatients, training, research and production of traditional medicines. The institute also has an exhibition room. The institute was established in 1978. After done with your breakfast, we will proceed towards to drop you to Bagdogra Airport. Our representative will help you with your exit formalities and the bid you see off. Like all good things, your Bhutan tours will come to an end. We will be happy to see you back. 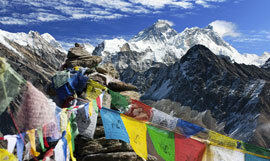 Do visit us because Bhutan has more to offer to you.